My work in progress Wednesday is just full of colour. I have started a new quilt this week – another classic pattern with bright colours. 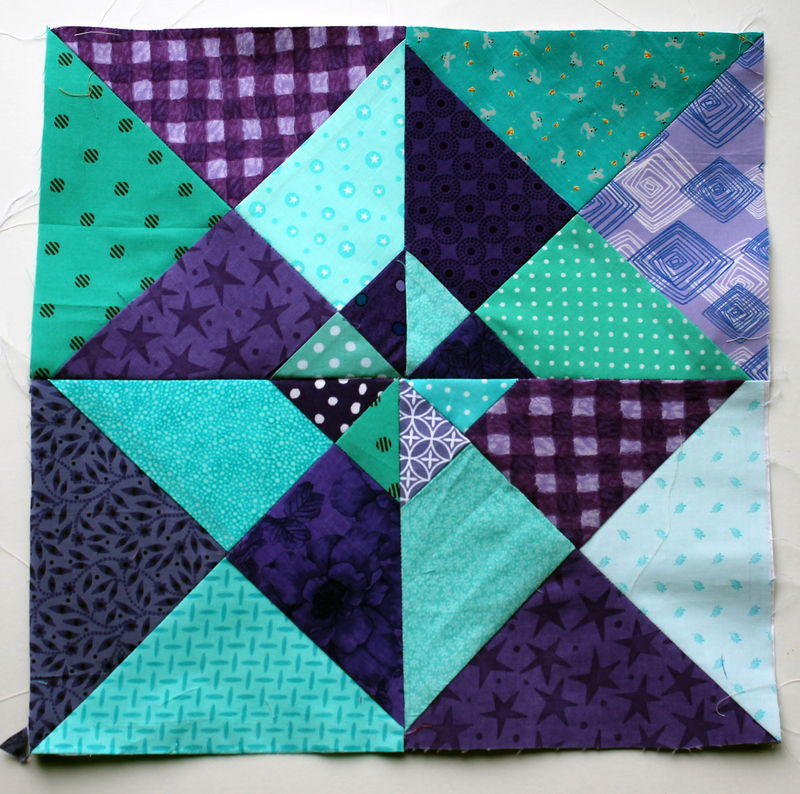 The pattern is called a double pinwheel and the components of the block are really simple. McCalls has a great link to making the block the traditional way – though I only used one half of their pattern. The link to their site can be found here. I once again raided my scrap box to start this project, as well as cutting into my stash a little – I was woefully short on purple scraps in particular! Because of the high contrast in the colours seams are everything and I must admit they are not as aligned as I would like with this block. Practice makes perfect, so onto the next block! 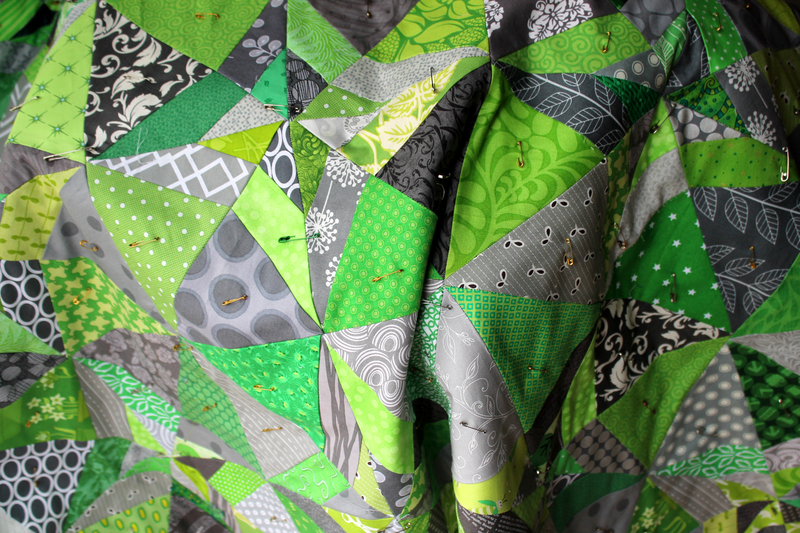 And last but not least, I have just finished basting the grey and green quilt I started a couple of weeks ago. Now I just have to quilt it! Came over here from WIP Wednesday- and just have to say- I adore your color choices! Thanks. I am really enjoying playing with colour at the moment. Some of it works, some of it doesn’t but it is all fun! The colors in your quilts are wonderful! Really brightens any day. I will be back to see more! I have made the block like the McCalls pattern a few times before. I like your design option for this block. I love color, so I love your quilts!! The double pinwheel is a neat block. I like the “layers” of it. Pink and gold is one of my favorite color combos ; I think removing paper from paper pieced blocks is my least favorite job. Your gray and green quilt is stunning I am looking forward to seeing how you decide to quilt it. Gorgeous! I love green and never thought of grey green…. hmmm ideas for the future. So glad I found your blog, or really you found mine. I love all your colours. I’m going to take an hour in here tonight to look at all your beautiful quilts. Glad you like the colours, I am really having fun with the playing and creating. I am also looking forward to seeing more of your stripe quilt. Thanks for stopping by my blog! You have some lovely things in progress, too! I love the green and grey. I have a piece of vintage fabric with those colors, but I never thought about using the scheme for a whole quilt! Thanks for the inspiration! Purple is my favorite color! Very nice block. Such lovely quilts & such quick progress too. Great color choices and blocks. Your quilts are so vibrant. You definitely have an eye for colour. Great job. I must admit I am in awe of your work. Your sampler quilt in particular is amazing. 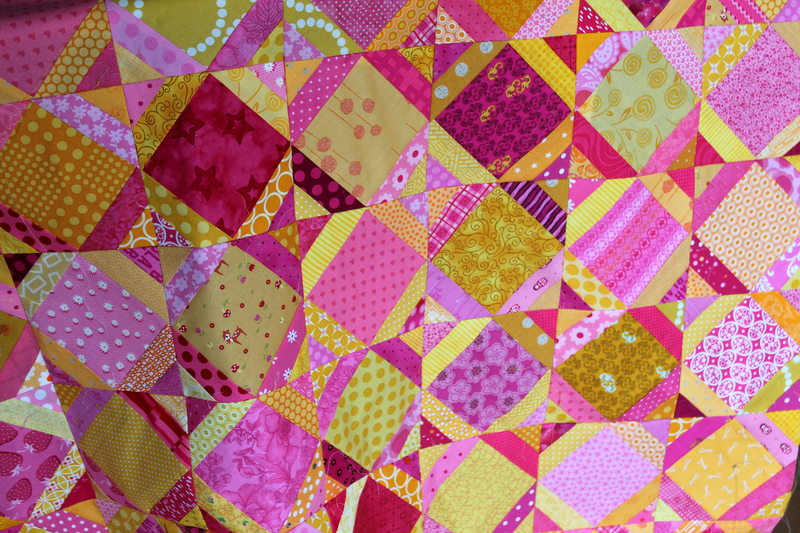 Love the block and also the pink and gold quilt! Is there a tutorial for that one somewhere? My wip Wednesday last week has the pattern for the pink & gold quilt. Let me know if you have any problems downloading it. I really love your blocks, especially the green one, great colours and I love the patterns you’ve used. Your niece is very happy with the progress of her quilt. She is very excited. She even had to show a friend her quilt today. Glad she likes it so far. Now to finish it! Your gray and green quilt is spectacular! And I was just going through and looking at all your paper-pieced aqua and red blocks — they are amazing! Well done! Your quilts are just beautiful. I love all the colors and fabric you chose, especially the gray and green quilt. I am loving that purple and aqua! And the grey and green is gorgeous as well!